Science”. This information was soon to bear fruit, for on 4th December 1941, Topf received an order from Himmler's headquarters for four-twinned four-muffle (or four eight-muffle) furnaces, giving 32 cremation muffles, for the Mogilew prisoner of war camp in the Soviet Union. On 9th December 1941, Topf accepted what was to be known as the “Mogilew Contract”. Following this order and before its acceptance by Topf, Prüfer requested a meeting with his two directors, in order to ask for a well-deserved bonus. The truth is that thanks to Prüfer's designs, the firm was very competitive in the field of cremation furnaces. They could now offer an eight-muffle furnace for 13,800 RM. whereas an equivalent battery of single-muffle furnaces from another firm would cost about 30,000 RM. In a month and a half, Prüfer had negotiated contracts for over 60,000 RM worth of three-muffle furnaces for Auschwitz and 55,200 RM worth of eight-muffle furnaces for Mogilew: a total of 115,200 RM for Topf. The designer of both these models was Prüfer himself, who had worked on them during his free time. 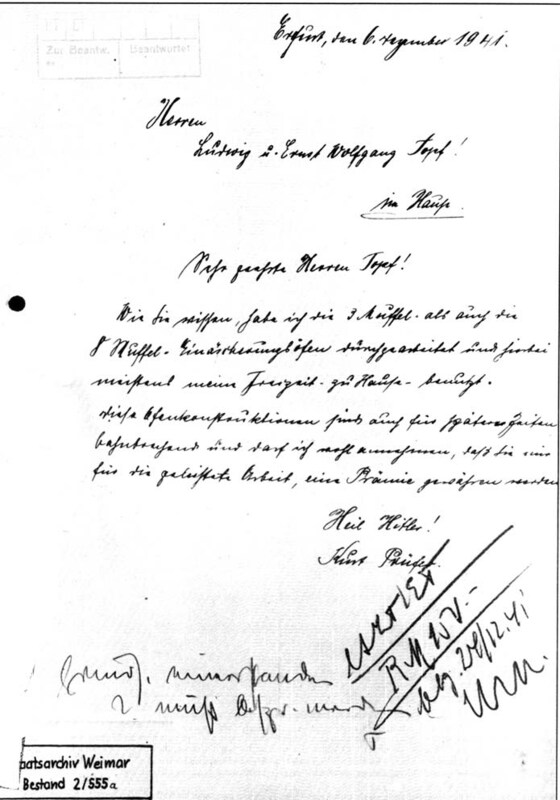 On 6th December, Prüfer put his request for a bonus in writing and sent it to the two Topf brothers. On 24th December, an exceptional bonus of 150 RM was duly paid [Document 3] In late 1941 and early 1942, the business deals negotiated by Prüfer for Topf, even though they may appear “special” or even monstrous, were in fact “normal” and in no way reprehensible.